Most of the 13 ESA-listed salmon stocks in the Columbia and Snake rivers remain at risk of extinction. The lower Snake River in eastern Washington state is one of Idaho's biggest economic and ecological boondoggles. For decades this dammed waterway has killed Idaho's salmon and needlessly received billions in taxpayer and electricity ratepayer money. But times are changing. There's a shift occurring on the lower Snake River, and we can choose to recognize reality or not. 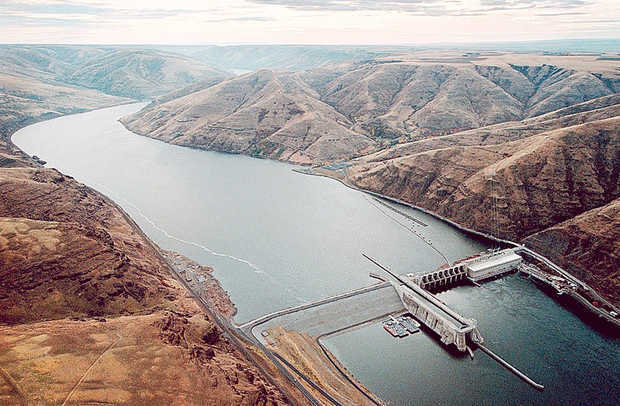 Fifty ye ars ago, boosters of the lower Snake River dams promised economic prosperity to the residents of Lewiston, Idaho, and Clarkston, Wash., with creation of inland seaports. While the dams succeeded at nearly wiping out Idaho's salmon and steelhead, the promised prosperity never did arrive. Moreover, recent trends show that shipping on the lower Snake River is becoming even bleaker. Farmers are finding more efficient and cost-effective ways to ship their goods to the global market. To stem the decline, the ports in and around Lewiston have been soliciting business from enormous oil companies who are trying to convert one of America's first Wild and Scenic River canyons and the Nez Perce tribal homeland into an industrial high-and-wide trucking corridor. The companies want to ship equipment built overseas up the lower Snake River, though Idaho and Montana and on to the destructive tar sands of northern Alberta. The tribe, Idaho Rivers United, other conservation groups and residents of the U.S. Highway 12 corridor have fought to block shipment of these so-called megaloads. A federal judge agreed earlier this month that the two-story-tall, two-lane-wide, 600,000-pound loads of industrial equipment could transform the wild character of this protected place. He ordered the U.S. Forest Service to block megaloads from passage on Highway 12. Meanwhile, the U.S. Army Corps of Engineers is proposing to dredge the lower Snake River waterway at a cost of $39 million over 10 years, which translates into a $18,900 subsidy per barge leaving the Port of Lewiston. The Army Corps also failed to include it its draft dredging plan a projected 10-fold increase in sedimentation scientists estimate will result from wildfire activity. It becomes clear that federal agencies managing the lower Snake River waterway are digging a financial hole, and digging it deeper. Finally, on Sept. 9, NOAA Fisheries squandered an opportunity to chart a course toward collaborative solutions to help sort out the mess. For 20 years the region has failed to do enough for our endangered wild salmon and the people who depend on them. Four times the government has drafted a new salmon plan. Four times a federal judge has sided with fishermen, fishing businesses and conservation groups and declared NOAA's salmon plans illegal. This could be the start of round No. 5. If finalized, the draft salmon plan would ensure a continued legal battle while we could be working on collaborative solutions. Last December, NOAA initiated interviews of more than 200 people, agencies, tribes and officials throughout the region. Salmon advocates are hoping the process can become the foundation for collaborative talks. The new draft salmon plan wouldn't be a very good start. Instead of moving us toward real solutions, this plan could force us all back into court. Despite congratulatory self-evaluations and exaggerated reports from federal agencies, most of the 13 ESA-listed salmon stocks in the Columbia and Snake rivers remain at risk of extinction -- including steelhead, chinook and sockeye salmon that return to the headwaters of the Salmon River just north of the Wood River Valley. U.S. taxpayers and Pacific Northwest ratepayers have spent $13 billion since the 1980s on salmon recovery measures that have not worked -- with about $10 billion spent in the last decade alone. Despite this expense, none of our ESA-listed salmon are close to being recovered. Many remain at dangerously-low levels, similar to conditions that led to their protection under the ESA in the first place. The majority of Idaho's salmon are killed by the dams on the lower Snake River. They don't make sense for taxpayers, for our salmon or for Idaho's fishing families and businesses.